We are providing waverunner - yamaha jetski boat. If action and adventure is your thing, then join us on an exhilarating Jet Ski expedition in the river sal - south goa. Riding the bikes is fun, but just wait till you hop on a Jet Ski and zip along the scenic river sal. Rs 350 for 2 rounds. Yamaha Wave runner V1 – The most affordable personal water craft with L3.22 x W1.17m x H1. 16m, Rider capacity 305 kg machine with 70 L fuel capacity and 57 liters storage capacity .The Engine is Yamaha TR-1 High OutPut 110 hp -1048cc engine , 4 Stroke Petrol Driven 155m High pressure pump. The machine comes with extended rear platform, dual mirrors , tow hook and hydro turfmat. Available with us Yamaha 2-stroke, 4-stroke Jetski. 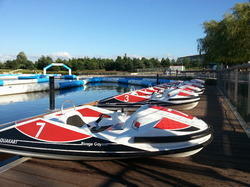 To suit your requirements for watersports. Jet Ski Rides are one of the many fun things to do Mandwa Beach, Alibag. If this is your first time renting Jet Skis in Alibag Near Mumbai or Gate way of India, don't worry. Our experienced staff will provide thorough instructions to make the most novice jet ski riders and drivers feel like experts before heading out. Up to two people can ride at a time Jet Ski rentals. Jet Ski is technically the brand name of a personal watercraft manufactured by Kawasaki and Yamaha and other company’s however it is commonly used in English to refer to a small water craft of this style of any type, and it is also used as verb to describe the use of this type of water vehicle.